This is one of the most common questions our affiliate brokers receive from clients. In NYC all written and verbal offers are non-binding. When are real estate offers binding in NYC for buyers? Nothing is binding for buyers until they sign and messenger the signed contract plus a 10% contract deposit to the seller’s attorney. A buyer is able to walk away at any time prior to signing the purchase contract. This includes after submitting an offer, after an offer has been accepted and after a contract has been sent out and reviewed by the buyer’s attorney. Because of this, savvy buyers often put offers in on multiple properties in the hopes of getting multiple accepted offers. Once that happens, they’ll have the luxury of deciding which one to proceed with. Note: It may harm your agent’s reputation if you do this too often. Sellers, listings agents and sellers’ attorneys incur actual costs when they messenger purchase contracts and offering plans to buyers’ attorneys for review. 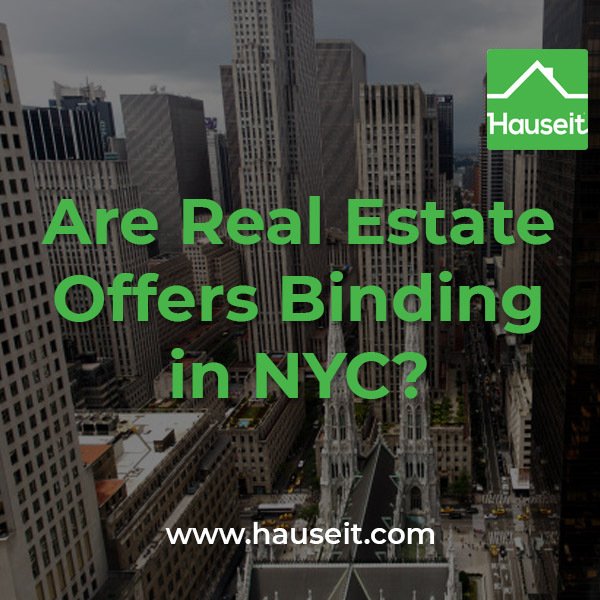 When are real estate offers binding in NYC for sellers? Nothing is binding for sellers until they counter-sign and fully execute the purchase contract. Until they send the buyers a copy of the fully executed contract, sellers are free to walk away from the deal or sell it to someone else. We’ve seen many instances of a buyer losing a deal to someone else even though he has already signed the contract. Because the seller has the ability to sign last, they have a tremendous amount of negotiating power at this stage. They can credibly test other buyers to see whether they will improve their offers while holding their current buyer completely captive. The buyer who has signed the contract cannot simply walk away as the seller can counter-sign and put into escrow his 10% contract deposit at any time. So for the buyer, while the signed contract is in the seller’s hands, the buyer’s hands are tied and the deal can be fully executed or fall apart at any time. Are real estate offers binding in NYC in regards to the REBNY Financial Statement? Though not legally required by any means, REBNY Financial Statements are widely expected by listing agents in NYC with an offer submission. A REBNY Financial Statement will be especially important when submitting an offer on a co-op in NYC. This is because the listing agent will want to pre-qualify that you will be approved by the board. Note: The REBNY Financial Statement is meant to be an accurate estimate of your assets, liabilities and income at a given point in time. While it does not need to be exactly accurate to the penny, it should be reasonably correct in good faith. The board needs to make sure all potential shareholders are financially qualified and solvent to ensure against delinquencies in maintenance payments. Too many delinquent shareholders in a building can be disastrous for a co-op as it will worsen the building’s financials and make it harder for all shareholders to get a loan. Moreover, poor financials will deter home buyers in the first place as they are buying shares of a corporation that owns the building! Warning: Gross misrepresentations of your financials in the REBNY Financial Statement can be held against you if it results in you being rejected by the board. The seller can come after you for damages in time wasted by going into contract with you even though you misrepresented your qualifications. Are real estate offers binding in NYC if it's in writing? Absolutely not. Just because an offer is submitted in writing (typically by email) does not make it binding in any way, shape or form. The same applies to verbal agreements or in person understandings. 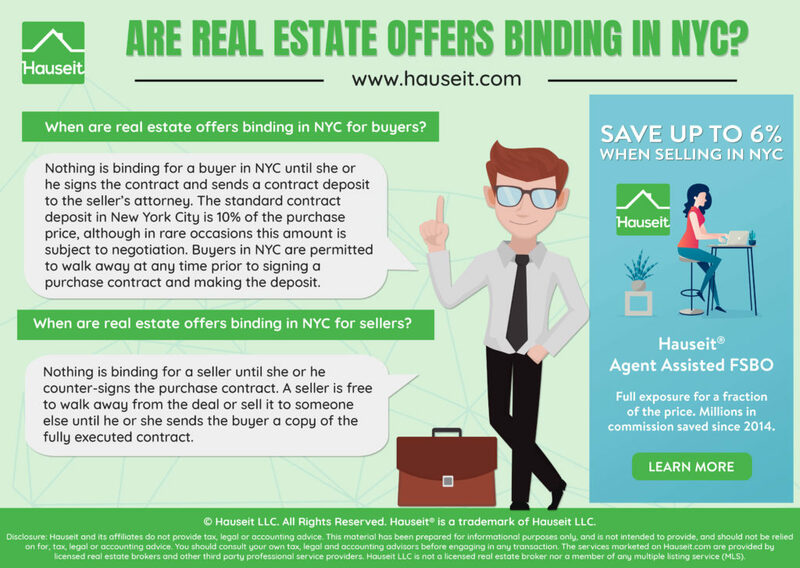 It’s important to remember that nothing is final or binding in New York City until both buyer and seller have signed the contract! Buyers with Wall Street trading floor experience typically have a tough time understanding this. On a trading floor, verbal price agreements are indeed binding as all phone lines are recorded. On a trading floor you can always “pull the tapes” to verify a price that had been verbally agreed to. 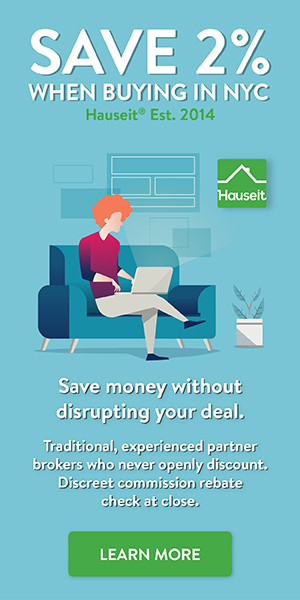 In real estate, there are no such conventions and it is more of a “Wild West.” Real estate brokerage is much less developed of a market than institutional securities sales and trading. We’ve included a typical offer submission email below. An offer email will typically attach a REBNY Financial Statement, pre-approval letter, short biographies and attorney contact information. Lisa, we are pleased to submit the following, above asking price offer of $1,500,000 for 127 Sullivan Street #3 on behalf of our client Josh Ekno. We’ve attached a short letter/biography, REBNY Financial Statement with tabs including proof of funds and multiple bank pre-approval and prequalification letters. Josh is due to receive an additional pre-approval letter from Chase on Monday. The offer is contingent on financing. Josh is open to signing the contract ASAP and believes this coming week is very possible. Inclusions: All fixtures and kitchen furniture (i.e. bar stools and cocktail bar mainly). Nursery can go unless the sellers don’t want it. Thank you for your consideration and please confirm receipt! Contact us for a free consultation from a top rated, local real estate attorney!